Great music doesn’t always have a face. Sure, we all get used to that stereotypical lead singer – looks we all wish we had, the charisma to captivate a sold-out arena, talent that keeps you engaged, and a personality that leaves you wanting more. When we see and listen to a band, we can feel like we’re best friends with the singer. So what happens when there is no lead singer? What happens when the band literally has no public face? Thomas Bangalter and Guy-Manuel de Homem-Christo met in 1987 while attending a secondary school in Paris. Both shared a passion for music so they began recording demo tracks with others from the school. Eventually, a band named Darlin’ was formed, which was a rock n’ roll trio that did shows around the UK. Reviews of the band were quite negative, leading one critic to dub their music, “a daft punky thrash.” The band found it amusing and used it as a reason to reconfigure. Darlin’ disbanded soon after, but Bangalter and de Homem-Christo decided to experiment with drum machines and synthesizers a bit more…and started a new band called Daft Punk. Today we look at the band’s sophomore album, Discovery which was released in March of 2001. It was very much a concept album, experimenting with a new Euro-house feel, which tends to combine aspects of disco, garage rock, funk and techno. It would become the soundtrack of an anime film entitled ‘Interstella 5555’, in which the segments of the film would become the music videos for the band. The duo has stated the album had a lot to do with their own childhood memories. It focuses on them from 0 to 10 years old, when they weren’t concerned with if music was cool or not. They simply made music they liked and they thought was fun, and didn’t judge or analyze. In fact they called it the most honest album anyone has ever made. Electronic music really started to hit the mainstream when I was in high school, and this album came out my senior year. It was so different that you couldn’t help but to put it on to see what this new sound was. You can throw on a mega-hit like ‘One More Time’ and instantly be blown away with the style, and it will make you want to check out other bands that make this kind of music. This album however is not as many hits, as it is telling this electronic story. It sort all blends together like a ‘Dark Side’ or something of that nature, where you don’t know where one track ends and the next starts. Despite only selling a couple million copies, it’s recognized as one of the 100 best albums of the decade. 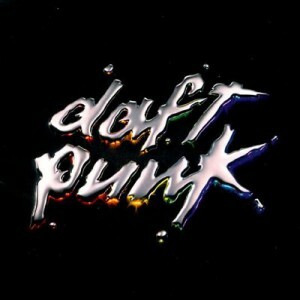 Daft Punk is known for emphasizing visual and story components with their music. They are always in disguises while in public or performing, usually in ornate helmets to assume a robot persona. I think this album fits that image so well. Discovery truly is all about the music, and not about the guys in the band. Try something new today for your hard-earned $5 bucks. NOT always. I guess you missed this, but it’s a pretty big deal especially considering it happened right here in Wisconsin. Before Daft Punk got huge, they came and played in a rain soaked field on Memorial Day of 1996 at Even Furthur. There’s some great old videos and an article or two worth researching. Fascinating! Just read the SPIN article about it. Sounds like it was still kind of in the transitional period between Darlin’ and Daft Punk? I gather it was about a year before their debut album dropped. I’ll have to watch the videos later, but nice find! Thanks for sharing.